View past webinars and learn about new webinars. Starting on January 15, 2015, CGNA will launch a series of new live webinars. Announcements on the CGNA website homepage. What is a LIVE Webinar? A webinar or web conference, allows a presenter(s) to share their knowledge over the web. Participants will be able to view the slides on their computer through a web program and listen to the presentation through an audio conference line. Presenters are selected based on their expertise in the field of gerontological nursing. Participants will be able to ask questions on line at the end of the webinar. Webinars are free for CGNA members. North Island College is pleased to be offering the Nursing Foot Care course at the Port Alberni Campus of North Island College. 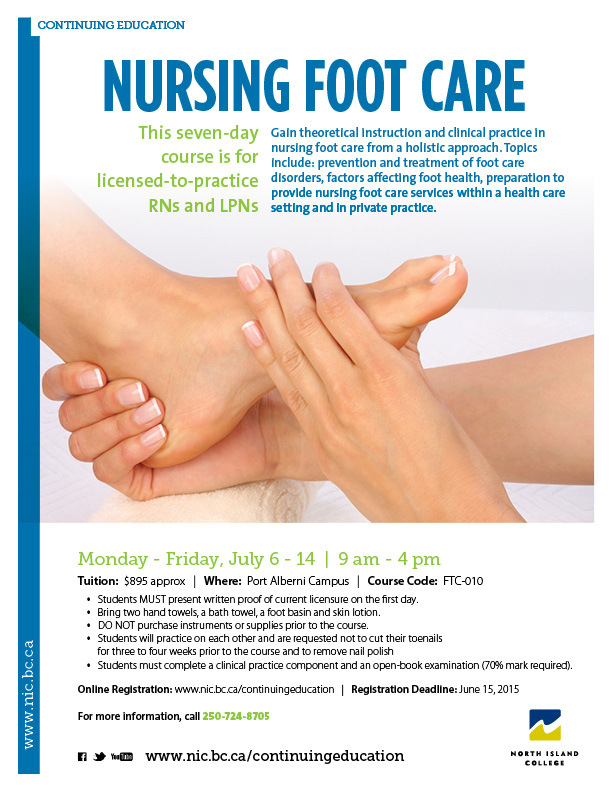 FTC-010 – Nursing Foot Care This seven day course is for currently licensed to practice RNs and LPNs. Students MUST present written proof of current licensure on the first day. Course runs Monday to Friday of Week 1 and Monday and Tuesday of Week 2. From a holistic approach, you will gain theoretical instruction and clinical practice in nursing foot care. Topics include prevention and treatment of foot care disorders, factors affecting foot health, preparation to provide nursing foot care services within a health care setting and in private practice. Participants must complete a clinical practice component and an open-book examination (70% mark required). Do NOT purchase instruments or supplies prior to the course. Bring two hand towels, a bath towel, a foot basin and skin lotion. You will practice on each other and are requested not to cut your toenails for three to four weeks prior to the course and to remove nail polish. Prerequisite(s): Proof of RN or LPN current, practicing registration/licensure. In collaboration with the BC Centre for Disease Control (BCCDC), CLPNBC has established the BCCDC LPN Online Immunization Course as the requirement for LPNs in British Columbia to prepare for the administration of immunizations. Life and Death Matters provides excellent training in hospice and palliative care skills and strategies in their online program. Palliative care courses are offered once per year and are limited to 20 participants per course. Training is suitable for practical nurses, health care workers, counselors, hospice volunteers, as well as other professional that work with the dying. Continuing Education credits may be applicable, depending upon location. Gain the knowledge and skills to caring for the terminally ill in an institutional or home setting. This online certificate will increase your awareness and understanding of the physical, social, emotional, and spiritual aspects of palliative care. These courses are appropriate for licensed practical nurses, pastoral care providers, human service workers, volunteers and the families of patients receiving palliative care. This 30-hour course, offered at Okanagan College in Kelowna BC, is designed for RNs and LPNs who wish to further their foot care skills for use in clinical and community settings. Please call 250-762-5445 ex 4589 for more information. The Foot Care Nursing program is a 40-hour course providing basic and advanced education and training in the care of the middle-aged and elderly foot. This course includes 24 hours of didactic education and 16 hours of hands-on clinical experience. Students will typically work on 8-10 feet during the course (80-100 toes). In addition to education for providing basic and advanced foot care, the student will learn the basics of private practice nursing and operating a small business. Students receive a Document of Completion and upon completion, the nurse may use the title “Advanced Foot Care Nurse”. The Foot Care Nursing course provides basic and advanced education and training in the care of the middle-aged and elderly foot. This course includes in-class instruction, self-study and hands-on clinical experience. Students will typically work on 8-10 feet during the course. In addition to education for providing basic and advanced foot care, the student will learn the basics of private practice nursing and operating a small business, as well as the current best practices for cleaning, disinfecting and sterilizing foot care tools. Prerequisite: Proof of current BC LPN or RN license required to register. Call to register: 1-866-734-6252. PEDEd offers an online Advanced Nursing Foot Care course to meet the needs of the active and enterprising nurse looking for a new career! Our PEDEd course is comprised of a comprehensive on-line theory course followed by our clinical tailored to meet your needs, putting all the theory and knowledge together. For practicing foot care nurses, our course is a great refresher to update your knowledge and skills! Email info@pededucation.com for more information. Visit www.peded.ca to find out who we are! Are you a Licensed Practical Nurse (LPN) looking to expand your skills in a challenging new direction? The Perioperative Licensed Practical Nurse functions in a number of diverse roles in the surgical environment including scrubbing, circulating, management of patient care and conducting research. The Program – The Perioperative Nursing for Licensed Practical Nurses program is approved by the College of Licensed Practical Nurses of Alberta. It is designed for LPNs who are interested in pursuing a career in surgical nursing. Nurses in the perioperative field provide care and support to patients before, during, and after surgery. LPNs are responsible for maintaining a sterile environment in the operating room, monitoring the patient during surgery and providing care throughout the process. Distance Delivery – Online distance delivery and in-person labs, provide LPNs with the hands-on skills required to work alongside surgeons and other health care professionals in a challenging, fast-paced and team-oriented environment – the operating room. – online or home study courses, Saskatchewan Institute of Applied Science and Technology, Saskatchewan. Perioperative Nursing/LPN is a/an advanced certificate program. It provides licensed practical nurses with the specialized knowledge and skill development needed to work in an operating room, ambulatory surgery centre, free standing clinic or other perioperative settings. This online and face to face course covers IV fluid administration and IV fluid therapy management. Through the completion of realistic, case-based lessons and interactive self-assessment exercises, participants will learn course material at their own pace, reviewing as often as they like. Videos and animations demonstrate best practices for techniques and procedures. This course is designed to prepare the Registered and Licensed Practical Nurse (RN/LPN) to initiate and maintain peripheral intravenous infusions. Through a combination of theory instruction and lab practice, students will develop their skills in IV insertion and maintenance, learn how to minimize patient discomfort and complications and increase insertion success rates. Students will gain knowledge in locating sites, selecting equipment, insertion, adjusting flow rates, identifying complications, and selecting interventions for the adult patient receiving IV therapy. After successful completion of this course, the participant will develop proficiency in this skill with clinical experience in their health care facility. Prerequisite: Current RN/RPN/LPN Licensure, any province of Canada. This course was designed to provide health professionals with additional skills that will allow them to draw blood as an added skill within their existing profession. This additional training may also provide opportunity for movement within an individual’s existing career. NorQuest College, Edmonton. Expand your scope of practice by learning special orthopaedic procedures. This program prepares you to work in a cast room, emergency department, orthopaedic physician’s office, or orthopaedic patient care unit. – Online courses, Athabasca University, Alberta. The post-LPN BN program is designed to provide licensed practical nurses with the opportunity to further their nursing education in a baccalaureate program that offers flexible modes of course delivery and opportunities to develop a clinical focus. Graduates of the post-LPN BN program are eligible to write the Canadian Registered Nurse Examinations. – UBC Okanagan School of Nursing. UBC Okanagan offers access to the second year of our BSN program for LPN graduates who have some work experience. This program will help you upgrade your credential and take the next step in your nursing career. This 10 week course has been designed specifically to support LPNs in making the transition from front line care providers to leaders/managers. It is intended to prepare LPNs to take on leadership roles in varied health care settings, with a focus on the residential care context. 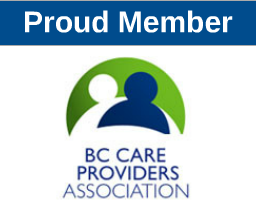 BC Eldercare Massage Course – BC Eldercare Massage is offering courses for beginners or existing therapists to gain highly regarded specialized skills to one of the fastest GROWING massage businesses today. Bone and Joint Care (HLTH 1397) Vancouver Community College When caring for adults we often identify or are questioned about bone and joint issues. This course will provide you with the knowledge and skills to identify the risk factors and specific interventions for key issues. You will learn to work with and support the desired patient-partnership approach to Osteoporosis and Osteoarthritis care while assisting your patients to live well with their disease. Are you a LPN or RN returning to nursing and requiring a pharmacology review? This distance course lets you practice math calculations and refresh your theory associated with administering medications. Once you have completed the theory, a skills checklist can be done at your work place with a full scope LPN/RN. Proof of current BC LPN or RN licensure is required to register. For RNs and LPNs in residential care. Expand your knowledge of assessment in this three-day course. Practice skills associated with heart and lung sounds. Learn to identify the potential risks and intervene before a crisis. Stethoscope required. Proof of current BC LPN or RN licensure is required to register. (24 hours). – Douglas College. Designed for health care providers working with breastfeeding families, this comprehensive course covers all aspects of breastfeeding management and support. Through exploration of a wide range of topics, such as anatomy, physiology, breastfeeding management, and counselling skills, you will develop a well-rounded and evidence-based understanding of current optimal infant feeding practices. Over the thirteen weeks of the course, you will acquire or polish the foundational skills you need to confidently support and empower families to reach their breastfeeding goals. – Grant MacEwan University distance courses specializing in assessment and management in the wound environment, management of chronic and problem acute wounds, and clinical application of wound management. – Self-paced, distance education, Douglas College, New Westminster, Coquitlam. Developed for Licensed Practical Nurses wishing to enhance their knowledge about mental health issues. Click here to visit VIU’s website. offers exam prep based on 16 sessions, typically covered in an 8 week period. The participants have as many as 8 exam sessions to test their knowledge and preparedness. In addition there are opportunities for student-led study sessions each week, as well as access to text and computer resources. Students can take the full eight week review or choose sections that they feel they need help in.